AlexFaye.com Education, technology, writing, gardening, eating, composting, aging, and golf. In short, I ruminate. Check Out My Tumblr Account! My first love outside of the tight ring of family was Ringo Starr. In 1964, I went to first grade at Saint Michael’s Academy, dressed daily in a grey jumper with white blouse, a white undershirt (my Navy dad, out on destroyers for half the year, called them “skivy shirts”), with black and white saddle oxfords on my feet, and clean white socks. My mother held my hand as we walked to school together, and I remember her quick kiss at the gate before she ran back up the hill to catch the bus, headed downtown to her job in a commercial laundry. So it wasn’t the parish priest, Father Frederick, or my beloved teacher, Mother Conception, or my parents who brought Ringo Starr to my attention. It was my sister, Vicki, 19 and just graduated from Cathedral High School. Vicki wore mascara and a bra; Vicki had a boyfriend. She talked on the phone for hours with her best friend Gloria, and together they played guitar and sang songs by the Kingston Trio, Peter Paul and Mary, and Joan Baez. 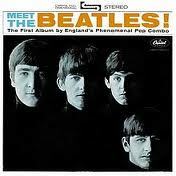 It was Vicki who brought the aptly titled LP home: Meet the Beatles. The cover art featured stark black and white photography of John, George, Paul and Ringo, dressed in black turtlenecks and with identical mop top haircuts. They are each lit so that half of their face remains in shadow. My handsome father sneered at their appearance, mocking their long hair and doleful faces. And the music — it was incomprehensible, silly. A few months earlier, President Kennedy had been shot right out of his Dallas motorcade. My father did not approve, and my mother never, ever broke ranks. It slowly began to dawn on my blooming first-grade mind that liking the Beatles was going to separate me from them, my beloved parents, who knew everything and who ran the world. To like the Beatles (when they did not) was a small, rebellious act for a Catholic girl in the first grade — a girl just learning to read, learning to add and subtract. Add the Beatles; subtract my parents. A tiny equation, secretive, and a little dangerous. I tried it, and nothing happened. They didn’t even seem to know that the Beatles were mine, and not theirs. It was clear, even then, that Paul was the pretty one, and Ringo, not even in line with the others, but positioned below, by himself, was the one with the saddest eyes, and a big and irregular nose — my father had a big nose, too — so it seemed to me that he was not going to be adored, like the others, who sang and played guitars. On stage too, he was behind the others, alone, keeping the beat. I don’t remember deciding to love him. It was more like I had to love him, because if I didn’t, who would? I lit a torch for Ringo Starr and carried it quietly, hot inside my heart. The Beatles broke up in 1970; I was in junior high. Love for the now-defunct band matured and ripened through high school, and I plastered my walls with images from their short career, in various incarnations: a painting of the four as members of an ancient British court; the boys joyously leaping in the air in their promo shot for “Help!”; Sergeant Pepper (the band clad in elaborately decorated, neon-colored military jackets with fat brass buttons); the pen and ink artwork from Revolver; the puzzle of the Abbey Road cover (the theory that Paul was dead allegedly confirmed there in the symbolism of that photo); the four glossy head shots from the White Album; the Beatles as desperados from the single release of “Get Back;” and finally, a shot from that final, heartbreaking rooftop concert, Let It Be. The images surrounded me, entered me somehow as I listened to the albums again and again, and although I’ve been smitten hundreds of times since then, the boys are still there, 48 years since Meet the Beatles, embedded in my psyche, the soundtrack of youth, first rebellion and first love.